The models at Reserve at Serenade opened to high praise! 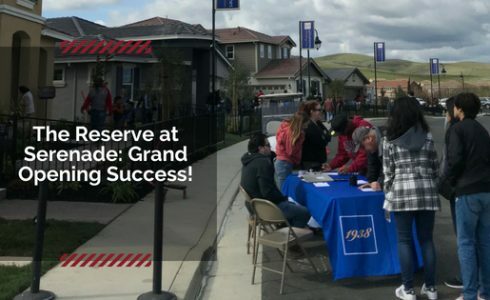 Over 1,000 people joined us over the weekend on February 24th to celebrate the opening of our newest community of single-family homes in Fairfield. Our new community grand openings are truly an event: visitors enjoy food, music, and entertainment for the kids while touring our decorated models. We even sold eight homes over the course of the weekend! The Reserve at Serenade, tucked along the convenient I-680 corridor, features spacious homes ranging in size from approximately 2,159-3,472 square feet of living space. Every home at The Reserve showcases beautiful kitchens, expansive living areas, and many other noteworthy details. There is something for everyone here. It’s centrally located at the crossroads of San Francisco, Sacramento, Oakland and Napa, world class shopping, culinary delights, and exciting happenings are all minutes away. Visit us online at DiscoveryHomes.com to learn more about The Reserve and sign up for the interest list to stay up-to-date on all the happenings!